So, my jeans, and the scale at my gym have made something quite clear to me....I've had a very fun summer: Dining out with friends, cocktails outside, ice cream, barbecues, and lots and lots of seafood and drawn butter....mmm. I've been lucky to go to a lot of great restaurants this summer, but now I need to buckle down - mostly because fall is coming and I can't get away with flowy blouses and dresses during the winter. And my modest income does not allow me to purchase an entirely new fall wardrobe. So, its time to start cooking my meals at home and bringing my lunches to work. But just because my lunch is healthy, it doesn't have to be boring. I'm trying to cultivate a new salad mojo in the kitchen. At whole foods I'll put the weirdest stuff on my salads, but at home I get stuck in the rut of the same veggies and proteins. This is my first attempt to break out of my comfort zone. Using a base of baby spinach and arugula, I added my standard veggies....grape tomatoes and a garden fresh orange pepper. I had some leftover roasted eggplant, and leftover quinoa....mixed them together and threw them on top.....then added cranberries because I like a little sweet in my salad. A little canned salmon for protein. A nice mustardy vinaigrette, and voila. A healthy lunch! This is yesterday's lunch, and today's is quite similar....minus quinoa, plus cranberries and some feta. So far, so good. I'm hoping to join you on this journey of eating healthier while staying creative in the kitchen! If only things like cheese dinners didn't tempt us so much! Your salad looks beautiful! Quinoa is soooo wonderful isnt it? Yummy yum! I like adding hummus to my salads. Your salad looks amazing! Its so easy for me to get bored with salads no matter how healthy they are! Mmm that salad looks good. I am SO with you. My pants are way too snug right now! This looks so tasty AND healthy - love it! 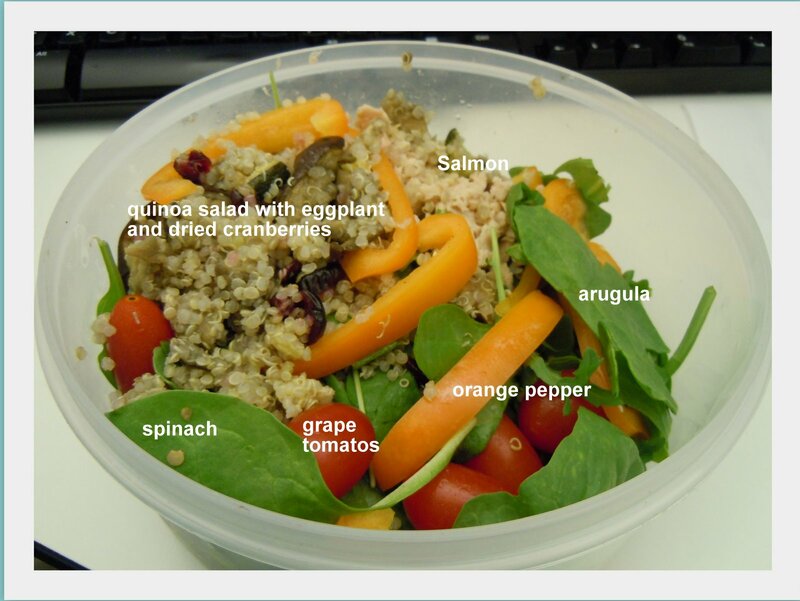 I LOVE Quinoa in salad! Nice work bringing a delicious and healthy salad that fills you up! I also love the mix of raw and roasted veggies. Well done!